Sprinkle the work surface with the flour. Unfold the pastry sheet on the floured surface. Cut the pastry sheet in half lengthwise into 2 (4 1/2 x 9-inch) rectangles. Place the pastries onto the prepared baking sheet. Cover with another piece of parchment paper and top with another baking sheet. Bake for 20 minutes or until the pastries are golden brown. Remove the pastries to a wire rack and let cool completely. Line a 9 x 5-inch loaf pan with plastic wrap. Spread the lemon sherbet in the bottom of the loaf pan. Trim the edges of 1 pastry rectangle to fit the loaf pan and gently press onto the lemon sherbet. 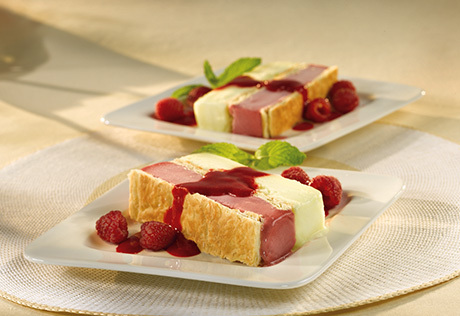 Repeat the layers with the raspberry sherbet and the remaining pastry rectangle. Cover the loaf pan and freeze for 4 hours or overnight. Place the raspberries and sugar into a blender or food processor. (If using fresh berries, let the mixture stand for 20 minutes.) Cover and blend until the mixture is puréed. Press the raspberry mixture through a sieve into a medium bowl. Invert the loaf pan onto a serving plate. Cut the loaf into 8 slices. Evenly drizzle the slices with the raspberry mixture and top with raspberries, if desired.